What is Initial Show configuration used for while creating flipping book? Can you tell me what "Initial Show" can do in the flash flip book? When you use A-PDF to Flipbook (free download here) to publish digital page turn book, you will see "Initial Show" in the design settings panel. "Initial Show" setting will enable you to show bookmark or thumbnail to the left of the flash flip book when the book is opened. But this setting is only available in Float and Spread template. 3. 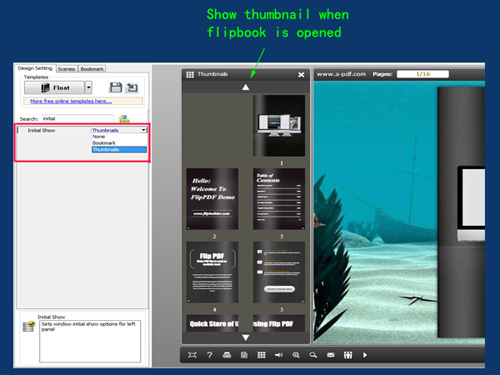 Customize the flipping book with different settings and output the flip book in defined format.